You are but a simple child. To be more specific, an Eevee or Eeveeloution child. 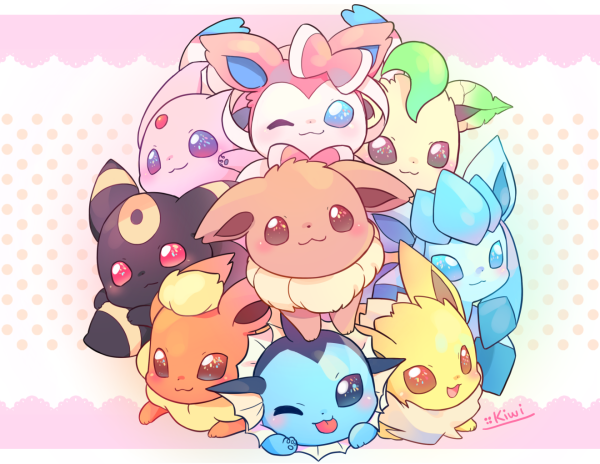 You have recently joined a club along with some other Eevees. Whether you're here because you thought it would be a fun experience or because your parents are forcing you to be social-- all are welcome! That is to say...as long as you follow the rules of the club! Apperance: A normal Eevee though his fur is a much darker shade of brown than a normal Eevee and his fur spikes up in some spots. Apperance: Shiny Eevee. Violet eyes, was thought a oddling because of her heart-shaped tail so was abandoned. Fur is smooothly combed. Wears a onyx pendant she picked up on her travels for a home. Member for how long/new: Been in for a week. Still needs to learn rules. Tell me if I did something wrong please! Appearance: In appearance, Kale is quite different than Jolteons that you would find here as his ancestors came from a completely different region with a very distinctive climate. He is Lop-Eared, meaning that his ears are both hanging down, and his fur is thin (Whitch is especially visible in the white fur around the neck) and smooth. It will only spike up when a Thunder Storm is approaching. Kale seems to pride himself on being so unique, as he wears a cloak to even further his distinctive look. Its pastel blue and is fully handmade. Member for how long/new: Kale is one of the first members and thus, has been around for just little less than 4 weeks. Apperance: long black hair tied back in two pigtails. Has a blue circle birthmark that looks like the one on Umbreon. She normally will keep her hair off the ground by braiding around her tail and has blue circle on the back of her hands. appearance: his yellow hair is darker than the other flarions, and his red fur is brighter. one of his paws has a bright yellow and red mark. member for how long/new: hes new, just joined a few days ago. So should we start now? Appearance: Yellow is pale, brown is darker, and leaves are autumn orange. Member for how long: She has been in the club for a day. Will you be starting the roleplay? uuummmmmmm. you have to make a rp. an actual rp.